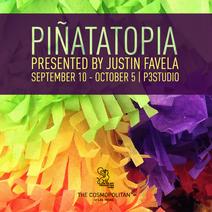 Justin Favela, Las Vagas native and UNLV graduate, is an established artist who draws his influences from art history, pop culture and his Mexican heritage. His work, which consists of combinations of painting, sculpture and performace has been exhibited in several spaces, including the Contemporary Arts Center, Trifecta Gallery and the Donna Beam Gallery of Fine Art. As of now, he is the new artist participating at Art Production Fund's P3Studio residency at the Cosmopolitan Hotel, LV.